^ Wollack, Edward J. Cosmology: The Study of the Universe. Universe 101: Big Bang Theory. NASA. 10 December 2010 [27 April 2011]. ^ Ryden, Barbara. Introduction to Cosmology. The Ohio State University. : 56. ^ 4.0 4.1 4.2 4.3 Alekhin, Djouadi and Moch, S.; Djouadi, A.; Moch, S. The top quark and Higgs boson masses and the stability of the electroweak vacuum. Physics Letters B. 2012-08-13, 716: 214 [20 February 2013]. Bibcode:2012PhLB..716..214A. arXiv:1207.0980. doi:10.1016/j.physletb.2012.08.024. ^ M.S. Turner, F. Wilczek. Is our vacuum metastable? (PDF). Nature. 1982, 298 (5875): 633–634. Bibcode:1982Natur.298..633T. doi:10.1038/298633a0. ^ Ellis, Espinosa, Giudice, Hoecker, & Riotto, J.; Espinosa, J.R.; Giudice, G.F.; Hoecker, A.; Riotto, A. The Probable Fate of the Standard Model. Phys. Lett. B. 2009, 679 (4): 369–375. Bibcode:2009PhLB..679..369E. arXiv:0906.0954. doi:10.1016/j.physletb.2009.07.054. ^ Masina, Isabella. 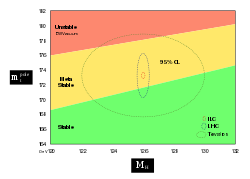 Higgs boson and top quark masses as tests of electroweak vacuum stability. Phys. Rev. D. 2013-02-12, 87 (5): 53001. Bibcode:2013PhRvD..87e3001M. arXiv:1209.0393. doi:10.1103/PhysRevD.87.053001. ^ Boyle, Alan. Will our universe end in a 'big slurp'? Higgs-like particle suggests it might. NBC News' Cosmic log. 2013-02-19 [21 February 2013]. [T]he bad news is that its mass suggests the universe will end in a fast-spreading bubble of doom. The good news? It'll probably be tens of billions of years . The article quotes Fermilab's Joseph Lykken: "[T]he parameters for our universe, including the Higgs [and top quark's masses] suggest that we're just at the edge of stability, in a "metastable" state. Physicists have been contemplating such a possibility for more than 30 years. Back in 1982, physicists Michael Turner and Frank Wilczek wrote in Nature that "without warning, a bubble of true vacuum could nucleate somewhere in the universe and move outwards..."
^ Peralta, Eyder. If Higgs Boson Calculations Are Right, A Catastrophic 'Bubble' Could End Universe. npr – two way. 2013-02-19 [21 February 2013]. Article cites Fermilab's Joseph Lykken: "The bubble forms through an unlikely quantum fluctuation, at a random time and place,"
Chaisson, Eric. Cosmic Evolution: The Rise of Complexity in Nature. Harvard University Press. 2001. ISBN 0-674-00342-X. Davies, Paul. The last Three Minutes: Conjectures About the Ultimate Fate of the Universe. Basic Books. 1997. ISBN 0-465-03851-4. Dyson, Freeman. Infinite in all directions (the 1985 Gifford Lectures). Harper Perennial. 2004. ISBN 0-06-039081-6. Gardner, James N., 2005, "The Physical Constants as Biosignature: An anthropic retrodiction of the Selfish Biocosm Hypothesis," International Journal of Astrobiology. Goldstein, Martin, and Inge F., 1993. The Refrigerator and the Universe. Harvard Univ. Press. Esp. chpt. 15. Guth, Alan. Inflationary Universe: Quest for a New Theory of Cosmic Origins. Addison-Wesley. 1998. ISBN 0-201-32840-2. Harrison, Edward. Masks of the Universe: Changing Ideas on the Nature of the Cosmos. Cambridge University Press. 2003. ISBN 0-521-77351-2. Hawking, Stephen. A Brief History of Time. Bantam. 1998. ISBN 0-553-38016-8. Layzer, David. Cosmogenesis: The Growth of Order in the Universe. Oxford University Press. 1991. ISBN 0-19-506908-0. Linde, Andrei. Particle Physics and Inflationary Cosmology. Taylor & Francis. 1990. ISBN 3-7186-0490-6. Penrose, Roger. The Road to Reality. Alfred A. Knopf. 2004. ISBN 0-679-45443-8. Prigogine, Ilya. Is Future Given?. World Scientific Publishing. 2003. ISBN 981-238-508-8. Smolin, Lee. The Life of the Cosmos. Oxford University Press. 1997. ISBN 0-19-512664-5. 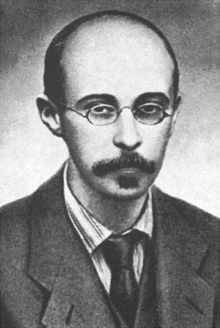 Smolin, Lee. Three Roads to Quantum Gravity: A New Understanding of Space, Time and the Universe. Phoenix. 2001. ISBN 0-7538-1261-4. Tipler, Frank. The Physics of Immortality. Doubleday. 1994. ISBN 0-385-46799-0. Davies, Paul. The Mind of God. Simon & Schuster UK. 1992. ISBN 0-671-71069-9. Islam, Jamal Nazrul. The Ultimate Fate of the Universe. Cambridge. 1983. ISBN 0-521-24814-0. Asimov, Isaac. The Last Question. Baxter, Stephen. Vacuum Diagrams, Deep Future, Manifold: Time, Exultant, and others. Modesitt, L. E., Jr. Gravity Dreams. Baez, J., 2004, "The End of the Universe". Caldwell, R. R., Kamionski, M., and Weinberg, N. N., 2003, "Phantom Energy and Cosmic Doomsday," Physical Review Letters 91. Hjalmarsdotter, Linnea, 2005, "Cosmological parameters." George Musser. Could Time End?. Scientific American. 2010, 303 (3): 84–91. PMID 20812485. doi:10.1038/scientificamerican0910-84. Vaas, R., 2006, "Dark Energy and Life's Ultimate Future," in Burdyuzha, V. (ed.) The Future of Life and the Future of our Civilization. Springer: 231–247. A Brief History of the End of Everything, a BBC Radio 4 series.